According to the survey carried out by Nielsen Global, Consumers trust Newspaper Advertising more than Online Advertising. Infact, just 1/3rd of the consumers actually trust online banner and video ads. 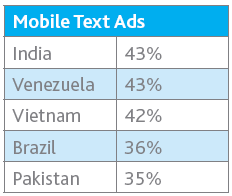 Mobile Text Ads (SMS type) are trusted the least with less than a quarter of consumers showing some degree of trust. Aside from brand Web sites (trusted by 70 percent of online consumers globally), sponsored search links, video ads, banner ads and mobile text ads are at the bottom of the trust league. Although Newspaper Advertising is the only one where the trust has fallen over last 2 years, it still reigns supreme when it comes to trust in paid form of advertising. 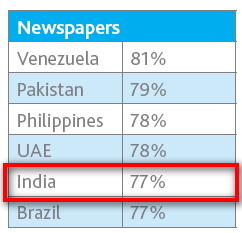 Although Globally, Newspaper advertising is trusted by 63% people, in India it is more significant and tops the chart with 77% of consumers trusting it. 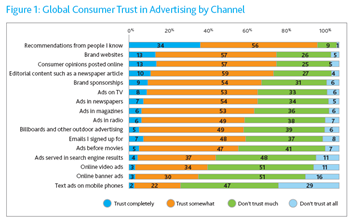 Here is the complete survey released by Neilsen on Global trust in Advertising. It was a great news about the consumers perception on ads. And can u please help me by sending for me some points or your opinions about “Online Advertising”. Actually i’m presenting about this topic. So can u please help me. Many FMCG brands are again having a relook at online media. I think in online media ad format needs to be changed. Pixel based ad format will not work in India. Consumer needs more information rather than information that is displayed in 250 X 250 pixels (In cases ads are shown in less than 250 X 250). Some good brands are still not using extensively online media in India for advertisements. There is a general feeling that offline sales can’t be genearated through online advertisements. My online venture revolves around these two issues. Mobile text ad numbers came as a surprise to me. It’s also very encouraging, as number of Mobile subscribers are huge in India (as compared to developed countries). We can offset slow online ad growth with a better mobile text ad approach. Rabi, if you actually see in reality, that makes sense…Tell me how many times have you taken an SMS ad seriously? I receive atleast 10-15 of the on daily basis and delete all of them without even seeing…. This is very surprising. 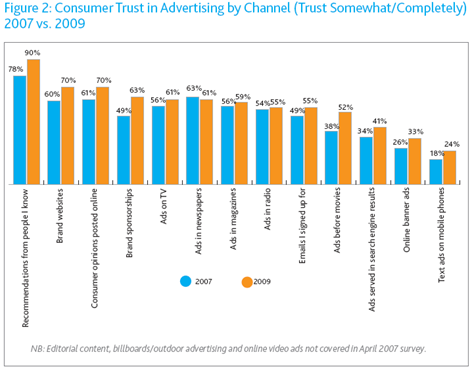 People still trust TV media more than the online media!